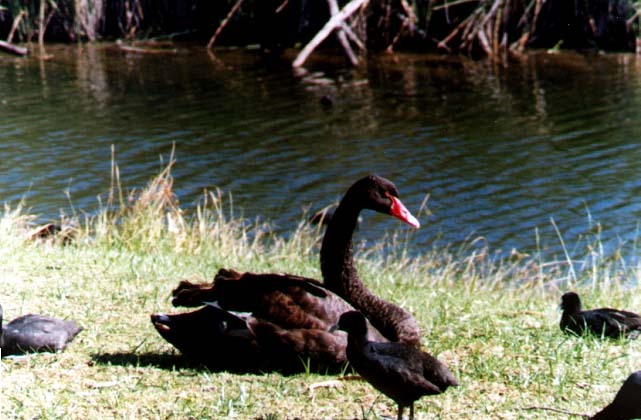 2nd row Black swan at Carinne Lake. Longweekend Camp Albany 1998. 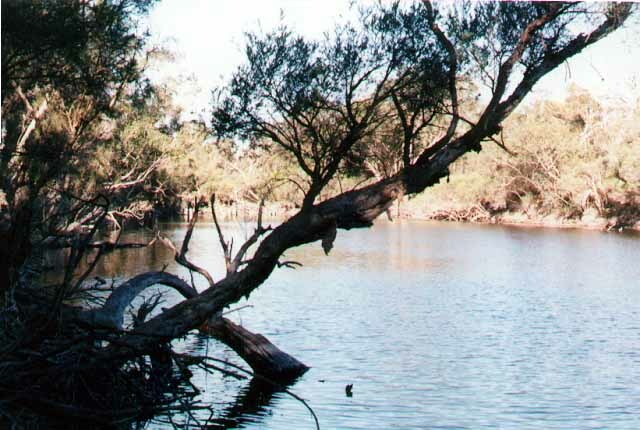 Frankland River on Muirs Highway. 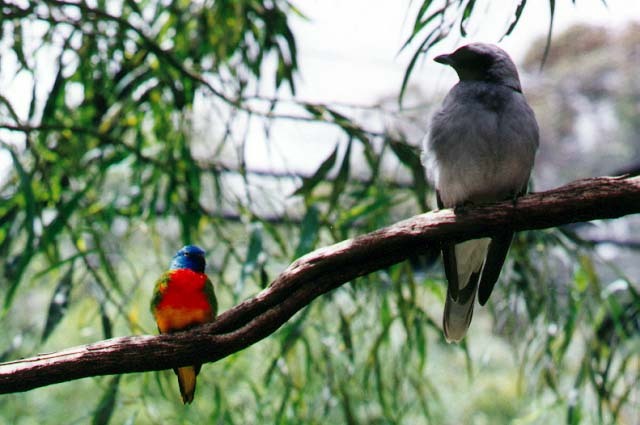 Rainbow lorrikeet and Black faced cuckoo shrike at Perth zoo. 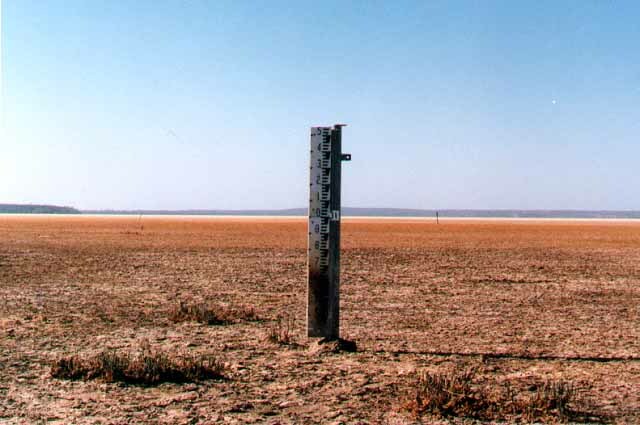 Lake Muir bone dry Jan 1998. 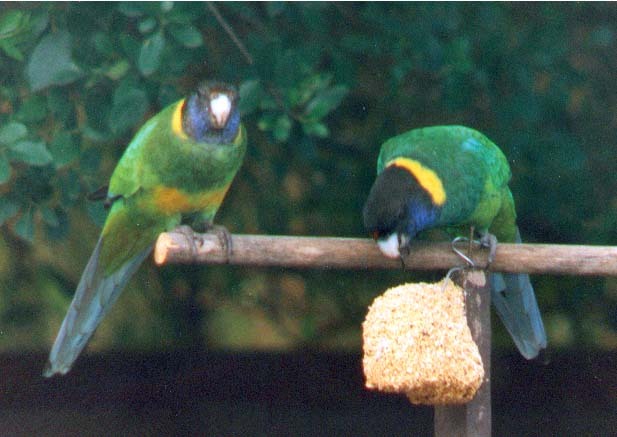 The Royal Australasian Ornithologists Union, more commonly known as Birds Australia, is an organisation dedicated to the scientific study and observation of native birds and their habitat in Australia. 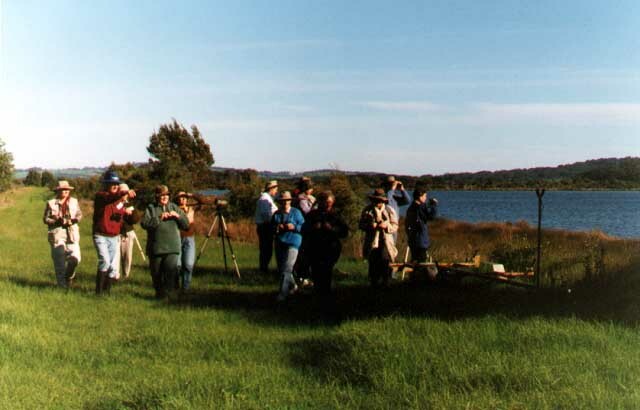 Its membership ranges from scientists to lay people, who just enjoy bushwalking and observing and recording birds in various habitats, be it in their own gardens or travelling into the countryside. An outstanding quarterly magazine WINGSPAN is sent to all members, together with a local newsletterWestern Australian Bird Notes, which contains a wealth of local information and anecdotal articles. As a member of RAOU, I have travelled widely around the State on weekend camps, which, on some occasions have been extremely hot, whilst others, wet weather gear was the order of the day, nevertheless, the campouts are well patronised and a good time is had by all, at the end of the day if the bird tally is high, it adds that extra satisfaction. To cater for those not so adventuresome, mid-week and week-end local walks are conducted, by members, whose knowledge of birds is usually of a very high standard, they are only too helpful to assist the newcomer to learn the art of twitching. Most of my bird recordings have been done whilst on private excursions into the bush in areas sparsely populated by humanity. 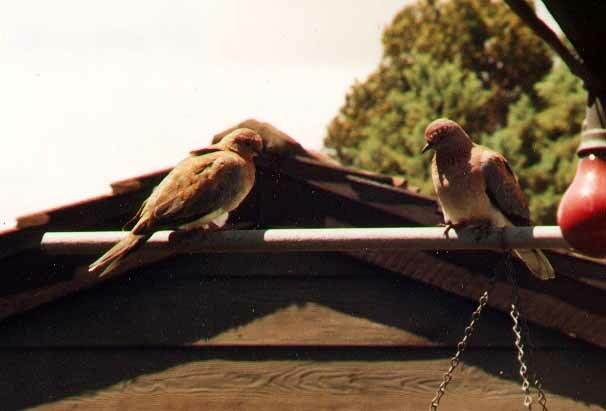 By popular request I have included some of my bird recordings. The files were recorded on a JVC portable professional SCR using parabolic microphones. The recording medium was Fuji Metal tapes. The wave editing and conversion to MP3 format was done using Wave Splitter 2v0 & Gold Wave. Feel free to use these recordings for private use :-) Acknowledgement of source would be appreciated. MagpieThe Western Australia Magpie a beautiful melodic sounding bird, very common - Following this you will hear a Grey Currawong, a Magpie Lark,(alternating calls) a Raven gets in on the act. The single high pitched sounds are from the New Holland Honeyeater. Also on the scene Is a Blackfaced Cookoo Shrike, the very quiet call of 5 or 6 peeps ending with a rise. He also has the last word! Brown HoneyeaterA very small greyish brown bird with a powerful and great song voice. Often thought by lay persons to be the Singing Honey Eater, which in fact has a very small vocabulary -- Recorded in my front garden in Parkwood. 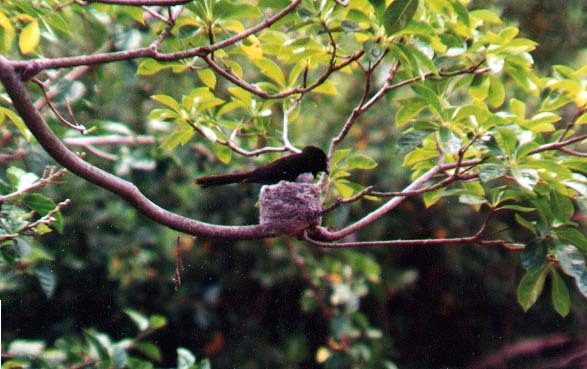 RavenMore often referred to as a crow, there are several species in the related family, the differences often only observed by their size and habitat. This recording was my first attempt using a temporary parabolic reflector, (a large kitchen wok!) the birds were about 100 yards away in trees in a park to the rear of my home. Note the bill clicking at start. Dawn ChorusThis really brings home the saying, Up with the birds! If you can sleep through this lot :-) Ah the joys of living under canvas.A veritable contest! 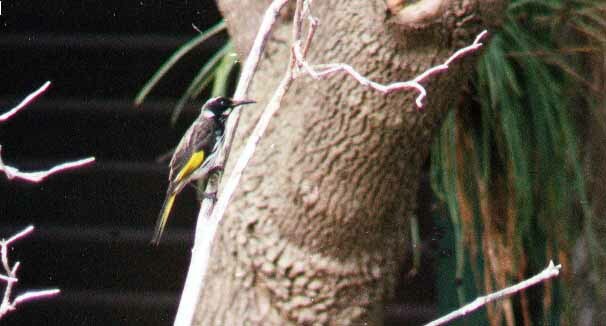 New Holland HoneyeaterA strikingly coloured member of the honey eater family, see picture above. It took me several weeks to capture this bird on tape because every time I went outside with the microphone he stopped. On this occasion he started again with his alarm call before breaking into the solitary single note dawn call. The sharp alarm is often made when "intruders" enter their territory, especially other small honey eaters.. 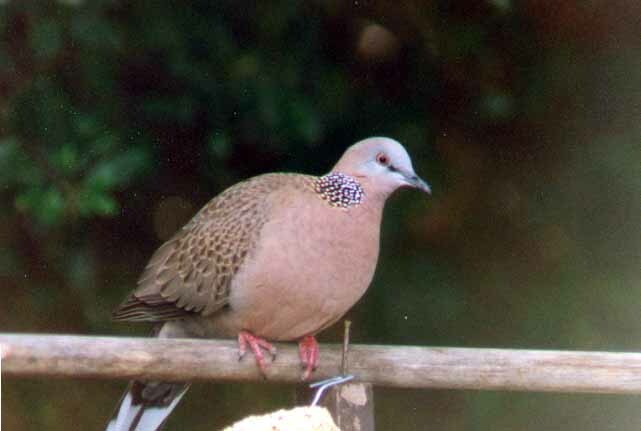 This page is dedicated to furthering support of our fragile environment and bird population. It is not an official RAOU site, but has been voluntarily created to support that organisation.